The US Treasury said exports would be allowed of services related to web browsing, blogging, e-mail, instant messaging, chat, social networking and photo- and movie-sharing. The move was intended to "ensure that individuals in these countries can exercise their universal right to free speech and information to the greatest extent possible", it said. Internet freedom is fast becoming a principle of US foreign policy. In February, Hillary Clinton said that countries restricting this freedom were violating the Universal Declaration of Human Rights. The Treasury Department said the move would make it easier for people in Iran, Sudan and Cuba to use the internet and exercise their most basic rights. The technology will likely be bought by small technology businesses - if they are able to access it - and some of it could help circumvent government restrictions on the use of programmes like Twitter and even internet-based e-mail accounts. 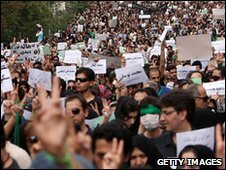 Iran clamped down on the use of Gmail ahead of planned protests in Iran last month. But while it tries to open up the flow of information for citizens in countries it deems repressive, the US is also pushing to tighten sanctions on Iran's government because of its controversial nuclear programme. "As recent events in Iran have shown, personal internet-based communications like e-mail, instant messaging and social networking are powerful tools," Deputy Treasury Secretary Neal Wolin said. The department has allowed the export of services to all three countries, and the export of communications software only to Iran and Sudan, as the export of software to Cuba is governed by the commerce department. Last year, software giant Microsoft barred users in five countries, including Iran, Cuba and Sudan, from using instant messaging services. People trying to use the service received an error message. It is not clear whether the governments affected will be able impose their own restrictions on these services. In Cuba, the numbers of internet users is still very low, so lifting sanctions may not have a major impact, observers say. Earlier this year, US Secretary of State Hillary Clinton said the US would be supporting the development of new tools to enable citizens to circumvent politically-motivated censorship. Any country which restricted free access to information risked "walling themselves off from the progress of the next century", she added.